Climate cases now available only through Music Caravan! Although Climate Cases were specifically designed to go over particular hard shell cases, they will fit over many gig bags. 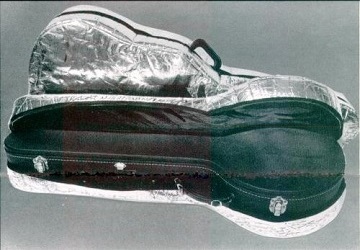 Obviously, the added protection that you get from the hard shell case won't be there, but they will still protect your instrument from the extremes in weather that can be so harmful! Be sure to check the dimensions carefully! If you want your case to look like this, that's your business! If you don't, that's ours!!! "The most significant and useful innovation in musical accessories in many years.... They grace my pre-war D-45S and RB-4 flathead"
Mike Longworth, CF Martin Co.
"An impressive product, a must for moderately-priced, high quality, and significant instruments I put mine on Elvis's old D-18 and the Big Bopper's guitar"
Patented reflective case reflects 90% of heat from exposure to direct sunlight. Protects from dust and rain. Protects instruments from damage caused by exposure to extreme changes in temperature and humidity. Keeps your case looking brand new, improves resale value!